For portable QRP work, I often use either an end-fed half-wavelength wire or a quarter-wavelength wire for an antenna. 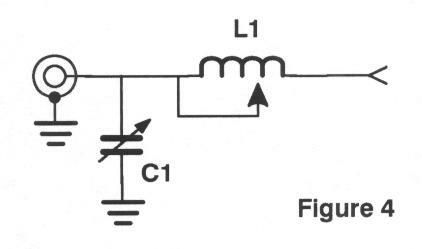 A simple "L" network (with the antenna attached to the capacitor side) provides a good match for a high-impedance load, such as a half-wavelength wire. 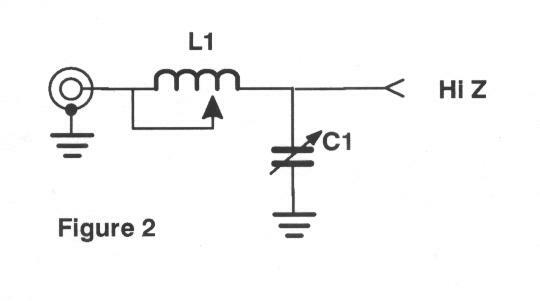 A series L-C circuit can be used to match a low-impedance load, as presented by a quarter-wave wire. I wanted to build a simple tuner which could be optimized for either situation with the flick of a switch. Most importantly for me, I wanted to make use of available parts from my junk box. Starting with the typical "L" configuration, I added a DPDT slide switch, as shown in Figure 1. 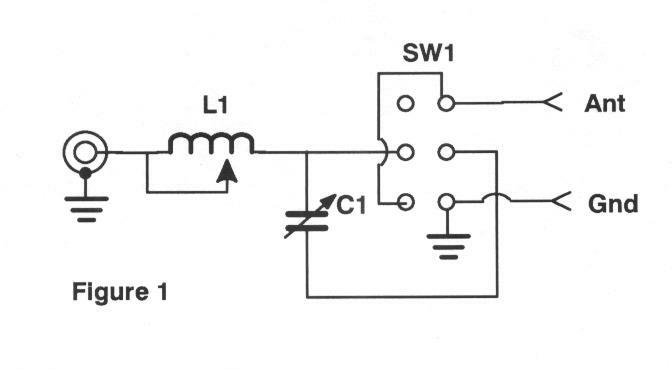 With the slide switch in the DOWN position, the configuration is a basic L circuit, as shown in Figure 2. This configuration works well with wires which are multiples of a half-wavelength. With the slide switch in the UP position, the inductor and capacitor are now in series, as shown in Figure 3. This configuration works well with a quarter-wavelength long wire. L - 40 turns of #22AWG enameled copper on a plastic 35mm film canister. Tapped in 8 places with a rotary switch to select the taps. C - 365 pf air variable capacitor. The shaft *must* be insulated from the chassis. I used an SO-239 jack for the input connection and a binding post for the output connector. If you use two identical connectors for the input and output, you can also reverse the connections and get yet a third configuration shown in Figure 4. Antenna tuners (or transmatches) are great projects for the budding homebrewer. They're fairly easy to build from scratch, usually very forgiving with respect to component values, and very useful to have around the shack. While I haven't tested this little tuner on every band with every conceivable load, it has performed well for me on 30 and 40 meters, the bands I use most often in the field. It should do a respectable job on just about any random wire antenna. No scientific breakthrough here. Just a simple antenna tuner with a fair amount of flexibility built in.